On February 25, 1985, at 8:15 am I suddenly felt ill. It must be the flu. I had taken public transportation to work, so looked at my watch to see if someone might be there with a car to take me home. I was the Acting Chair of the Biology Department at Atlanta University, had my own cancer research laboratory, and was raising two teen-aged boys by myself. But it wasn't the flu, but chronic fatigue syndrome, which didn't go away. After two years of struggle, my two sons graduated from high school and I went to Caye Caulker, Belize, for a complete rest thinking I would get well and return to my active life in Atlanta, Georgia. Why Caye Caulker, Belize, you ask? My cousin had been here and told me two things: "They have electricity, but nobody wears shoes." That seemed like the right combination. I had a fever all the time, so I was always felt chilled. Tropical temperatures should keep me warm. And, if they had electricity, I could take my computer and continue my theoretical research. I didn't get well, but learned to live an interesting life within my limitations based on desk-top publishing from my hammock. 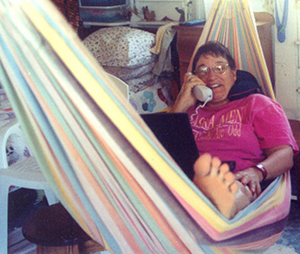 I couldn't think sitting up, but if my head was propped, as in a hammock, and I didn't have a deadline, I could wait for the right word to come. I asked a friend how I could make a contribution to the ground-breaking environmental work that was going on in Belize with my computer. 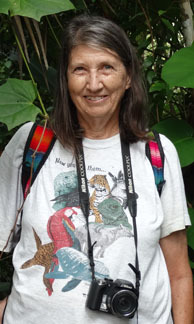 He said, "If the Belize Audubon Newsletter could come out regularly, that would really help." So, I walked into the Belize Audubon Society office and volunteered. That was 1989 and I am still doing their newsletter. Then my friend Dorothy Beveridge asked me to type up her late mother's poetry for the family. I suggested we do a book of them, so Poetry and Me a Poet by Mary Constance Belknap Straughn became my first book. I registered with the Caribbean Community (CARICOM) as a Belizean publisher and got an ISBN publisher prefix for the international book numbering system. I had heard about the environmental work in Belize, but the cultural diversity was a pleasant surprise. There are four indigenous languages with cultures to go along with them, as well as several lively immigrant languages and cultures. I was interested in Garifuna, so I wanted to go to a Garifuna village. Some little boys came to my house selling bread, who were not from Caye Caulker. They said they were from Hopkins. When I said I wanted to visit, one said, "Mrs. Marcella Lewis teaches Garifuna to people like you." That seemed like a pointed message, so I went to Hopkins and looked up Mrs. Marcella Lewis. I told her that I didn't have money to pay her for language lessons, but suppose we use her work as the text for my lessons and in return I make a book. Her answer was, "Better than that would be nonsense!" So, Walagante Marcella: Marcella Our Legacy was my second book, a bilingual one in Garifuna and English. Dorothy Beveridge was born and raised in North Carolina, USA. She earned her BA in Early Childhood Education and taught in pre-schools and primary schools. After moving to Belize, she volunteered with Belize Audubon Society and Belize Tourism Industry Association doing environmental education. She has been writing children’s books for her young relatives and friends’ children for many years. Using her husband’s wildlife photographs, she has written a children’s series, Caye to Learning. She and Judy had worked together on many projects over the years. When several people asked Judy to publish children's books, she thought of Dorothy's background and asked her if she would join me. In 2011 Dorothy Beveridge was added as Children's Editor and is now Associate Editor.